What makes Honda Accord Hybrid an attractive contender in the auto industry is its hybrid drive train. This vehicle brings 196 net horsepower when a 2.0L four-cylinder get together with an electric motor. The catch is to offer fuel efficiency to the users. It is rated at a surprising a shocking 3.7 L/100 km (64 US mpg) in the city and 4.0 L/100 km (59 US mpg) on the highway.I wanted to check this amazing rating, so I tested this vehicle in a very cold weather. During a week of testing, I realized that it indeed pushed away ice and snow that came into its way but it wasn’t driven at an economy level. My average rating was an 6.1 L/100 km (39 US mpg). 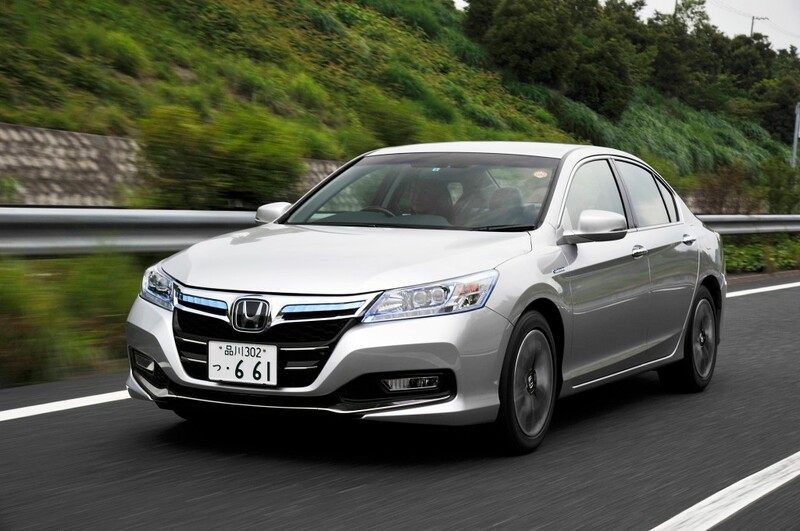 If we take a look at styling of Honda Accord then it becomes clear that it’s not really remarkable vehicle. Its design is quite familiar; it seems that same team finalized the style of front end, rear and sides of the car. The front end brings a row of LED driving lights and brings LED headlights. Light blue shade is given to front grille chrome and headlight glass, just to make Honda Hybrid version somehow different from Honda Accord. Front end crease can be termed as a “character line” that angles up from behind the front wheel well toward the back. The rear of Hybrid is quite bulkier. The bend of rear passenger window line offers a tough rear pillar’s appearance. Trunk lid is narrower than Honda Accord. The LED tail light pods are huge and they angled toward the front of the car. There is also a small rear spoiler in Hybrid version. The fascinating attractive 17-inch wheels has 225/50-sized rubber, that offers perfect turbine looks to wheel. Although look of Hybrid is not really exciting but it is indeed more chic, bolder and more ample. You will surely like interior setting of Honda Accord Hybrid. Interior is quite big and comfortable. Material used for interior designing is quite remarkable and Honda did the finishing and fitting in the perfect way. I liked contrast stitching. You will find soft-touch plastic along with fine texture everywhere inside. Two-tone colors combined with a little bright work definitely make the interior very chic and attractive. In order to add comfort to this setting, Honda fit heated and power-adjustable seats. The dashboard is quite short. The instrument bin has a floating-needle speedometer and digital gauges that alert about fuel, battery level and power/charge activity. You will surprise to see Honda’s two screens at center stack. The top large screen brings vehicle information, car settings, navigation, media,phone and back-up camera functions. Below you will see a small touch-screen that informs you in a unique manner regarding what is up on big display. Below this touch-screen, you can see a dual-zone automatic climate control system and rotary-knob button input. There are also some hard buttons that give direct access to core functions such as navigation.Although this system sounds very confusing but you will find it quite useful after one week of practice. Hybrid Version equips with refined driver assistance technology in the form of forward collision warning and lane departure warning systems. Most amazingly, its brings innovative LaneWatch blind-spot display- a camera in the passenger side-view mirror. In case you signal to right then screen displays what is beside you and shows you what vehicles are potentially in a dangerous position. There are three back seats equipped, each equips with a headrest and a seatbelt. It has impressive legroom and headroom while there are two comfy outboard seats as well.the center position is narrow and good for only kids. Open wide doors offers easy access to passengers. Trunk is narrower due to Hybrid battery but it still has enough space for your luggage and groceries. No matter what the driving situations are, Accord Hybrid is undoubtedly quite powerful. CVT find ideal ratio in a couple of seconds at higher speeds. Vehicle’s operation is quite smooth. The car begins its operation by getting power first from electric motor and you will surely find it hard to predict its gas engine’s auto start/stop feature. What I really don’t expect in Hybrid are its grabby brakes since they make driving experience forgettable. Comfortable and luxurious ride is offered by Hybrid as it knows how to kick out every hurdle that comes into its way. Weight of Hybrid is 1,636 kg (3,606 pounds) but it never feels heavy. I recommend you to go for Accord Hybrid since it offers stylish interior/exterior, smooth operation, comfortable ride, high-tech driving assistance, and unforgettable characteristics on road. This vehicle is quite suitable for both hypermillers and frugal living lovers.Honda Accord Hyrbid is priced at $35,690 and no doubt hybrid Sedan really worth it.